Watch this documentary before you read the rest. the words are mostly unnecessary. US which speaks about right to free speech in reality and practice is often the opposite. The media is manupulated to a degree unthinkable from outside if one doesn't know the mechanism. Israeli-Palestinian conflict is a very burning example of such disparity & bias in US media. Peace, Propaganda & the Promised Land: U.S. Media & the Israeli-Palestinian Conflict is a documentary that provides a striking comparison of U.S. and international media coverage of the crisis in the Middle East, zeroing in on how structural distortions in U.S. coverage have reinforced false perceptions of the Israeli-Palestinian conflict. This pivotal documentary exposes how the foreign policy interests of American political elites--oil, and a need to have a secure military base in the region, among others--work in combination with Israeli public relations strategies to exercise a powerful influence over how news from the region is reported. Through the voices of scholars, media critics, peace activists, religious figures, and Middle East experts, Peace, Propaganda & the Promised Land carefully analyzes and explains how--through the use of language, framing and context-the Israeli occupation of the West Bank and Gaza remains hidden in the news media, and Israeli colonization of the occupied terrorities appears to be a defensive move rather than an offensive one. The documentary also explores the ways that U.S. journalists, for reasons ranging from intimidation to a lack of thorough investigation, have become complicit in carrying out Israel's PR campaign. At its core, the documentary raises questions about the ethics and role of journalism, and the relationship between media and politics. Interviewees include Seth Ackerman, Noam Chomsky, Rabbi Arik Ascherman, Mjr. Stav Adivi, Hanan Ashrawi, Robert Fisk, Neve Gordon, Robert Jensen, Rabbi Michael Lerner, Karen Pfeifer, Alisa Solomon, and Gila Svirsky. Watch a short review of the documentary here in you tube. The full report (about 1 hour) is in google video. 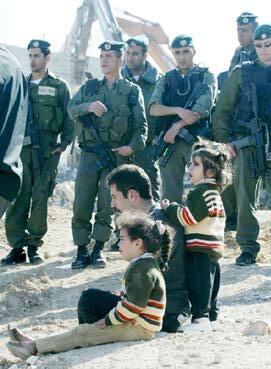 image credit: Israeli soldiers guarding demolition of Palestinian houses while a father is made to watch with his two daughters. AL JAZEERA | Alternative Perspective: Al Jazeera presenting a 360 degree view of the world and what is going on around: Al Jazeera, the Qatar based news channel has started their English service recently to provide a balanced perspective to the world. It is the most popular news service in the Arab-speaking world, will now be competing with CNN and the BBC in Europe and America. Its now available in many cities around the world. Also from online you can watch it for free. Here is the link. Currently at a time you can watch 15 minutes, but can stop and replay to watch continuously.